Confused about which Nespresso capsules to buy? Our guide to the most popular Nespresso capsules lists the seven top-selling and top-rated capsules for Nespresso machines, with full reviews and tasting notes for each capsule. Do you own a Nespresso machine? Nespresso offer 24 different capsules, ranging from espresso capsules to Lungo capsules, Pure Origine capsules and even a range of Decaffeinato capsules for people who prefer their coffee without any caffeine. In 2016, Nespresso also added Intenso, which contain very intense espresso coffee, and Variation built around the popular Livanto espresso capsule with a variety of special flavors for people who prefer a more interesting cup of coffee. In total, there are 24 different Nespresso capsules to choose from, all of which have their own unique tastes. Our guide to the best Nespresso capsules lists all of the capsules available from Nespresso, with tasting notes and flavor profiles for each one. We’ve also included links to Amazon.com for each type of capsule, where you can buy Nespresso capsules at the lowest prices. So, What Are The Best Nespresso Capsules? Ristretto capsules, which are the best “all purpose” Nespresso capsules that you can use for everything from straight espresso to cappuccinos, lattes and more. Kazaar capsules, which are the strongest Nespresso capsules on the market and the best if you like your coffee to taste strong, rich and full of intense flavor. Arpeggio capsules, which are mid-strength and creamy. These capsules are quite similar to the Ristretto capsules, but have a slightly duller, less edgy taste. Vivalto Lungo capsules, which are designed for a longer shot of Nespresso and a 110mL sized serving. These are the best Nespresso capsules for Americano-style coffee, since they’re made to taste their best with a little bit of extra water. 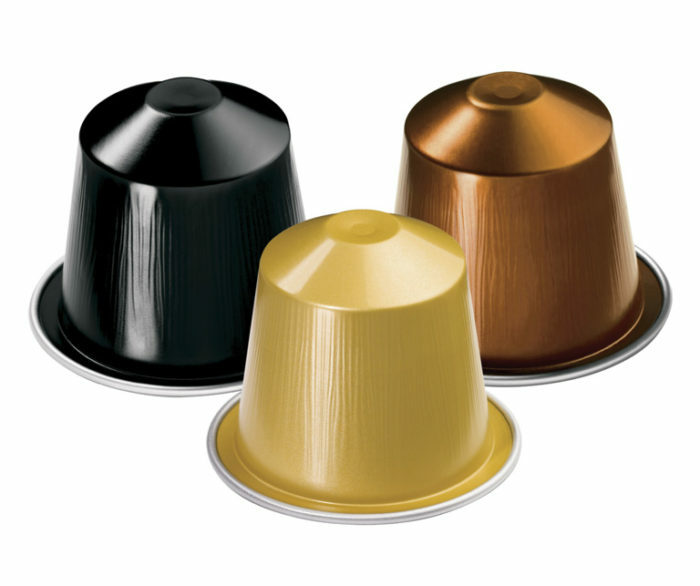 Decaffeinato Arpeggio capsules, which are the most popular decaf Nespresso capsules. These capsules taste just like Arpeggio capsules but don’t contain any caffeine, making them the best choice if you have a caffeine sensitivity or just prefer the taste of coffee to the energy boost. Espresso capsules are, as you’d expect, ‘short’ espresso coffee. Nespresso sells six different Espresso capsules, ranging in strength from smooth and light to strong and tasty. Intenso capsules are strong, blended origin espresso capsules that are perfect for people who prefer strong, full bodied coffee. Lungo capsules are Nespresso capsules for a ‘long’ coffee, such as an Americano or a traditional Italian hot coffee. These capsules are the best choice if you prefer a long, hot cup of dark coffee. Decaffeinato capsules are decaffeinated coffee. Nespresso sell three different decaffeinated capsules, which range in strength and taste. Variation capsules contain Livanto espresso, but with a variety of extra flavors added for people who prefer a little extra taste to their coffee. Finally, Pure Origine capsules are Nespresso’s version of specialist coffee. These capsules contain espresso coffee sourced from a specific coffee growing region and are aimed at coffee enthusiasts. Nespresso uses a zero to 12 scale to rate the intensity of each coffee variety. The higher the rating, the more intense and full the taste, meaning you’ll want to stick to the higher rated Nespresso capsules if you prefer an intense, full-bodied cup of coffee. On the other hand, if you prefer your coffee a little on the milder, less intense side, you’ll probably prefer the lower intensity Nespresso pods (especially those rated 7/12 or less). Ready to compare? Below, we’ve listed all of the Nespresso OriginalLine capsules, sorted into categories based on intensity, brew volume (25mL, 40mL or 110mL) and flavor. We’ve listed all of the Nespresso capsules below, grouped into the six different categories Nespresso uses to sort its capsules. Each category is sorted by intensity, with the most intense capsules at the beginning and the lighter, less intense capsules at the bottom. Intenso capsules are the strongest, most intense Nespresso capsules available. These capsules all have high intensity ratings (usually 7/12 or higher) and are designed to be served as 25mL ristretto or 40mL espresso shots. These capsules are a great choice if you like strong, flavorsome espresso. You can also use these capsules to make great lattes and cappuccinos. Kazaar, the strongest Nespresso capsule, is listed on our Most Popular Nespresso Capsules guide because of its high review scores from customers and popularity. This category also contains Ristretto capsules, which are the top-selling Nespresso capsules on the market and the best choice if you want a very balanced espresso. Espresso capsules fit somewhere in the middle, in terms of intensity. These capsules are less intense than the Intenso capsules featured above, but still offer enough intensity to make great espresso coffee. Of the four capsules listed below, Volluto capsules are the most popular. These capsules offer a light, pleasant espresso made from South American Arabica beans. If you’re not sure of which capsules to buy, we recommend starting with a pack of Volluto to see if you like the taste of mild, mid-intensity espresso. Nespresso’s range of Pure Origin capsules are sourced from unique locations, such as India and Brazil. These capsules only contain a single origin of beans, which means that the coffee beans used in each capsule are only ever sourced from one region. If you’re looking for a specific taste, you’ll enjoy all of the single origins. From a sales popularity standpoint, the Indriya from India capsules are the most popular of the Pure Origin line. Indriya from India Indriya from India is, as you'd expect from its name, made entirely from Indian Arabica and Robusta beans. This coffee is designed for ristretto (25mL) and espresso (40mL) sized brews and has a very rich, full flavor with hints of nutmeg, cloves and pepper. Dulsao do Brasil Dulsao do Brasil is a Brazilian sourced coffee made using high quality Bourbon coffee beans. The beans are dried in the sun, creating a sweet flavor caused by the mucilage in the coffee. This coffee has a light intensity level (about 4/12 in terms of the intensity of the taste) and a mild sweetness, making it great for people who prefer a light espresso to start the day. Rosabaya de Colombia Rosabaya de Colombia is made using high quality Colombian coffee beans, with a flavor that mixes dark chocolate with blackcurrants, blackberries and other dark berries. If you like your coffee to have a rich flavor with subtle hints of fruit, you'll love Rosabaya de Colombia. Bukeela ka Ethiopia Bukeela ka Ethiopia is made using Arabica beans sourced from Ethiopia, with a rich taste that contains hints of smoke and nutmeg. This coffee has an intensity level of 3/12, making it a great option if you like a mild, Lungo sized (110mL) cup of coffee to start your day. The beans used in these capsules are taken from two different roasts, one of which is dried in the sun to create a slight sweetness, while the other is kept completely natural and unwashed throughout the roasting process. Lungo capsules are perfect for making longer, less intense coffee. These capsules are designed to make a 110mL cup of coffee, which sits somewhere between an espresso and a traditional Americano in terms of richness and intensity. If you prefer an Americano-style coffee, you can always add hot water to any of these capsules to create a more watery, less intense cup of coffee. Of the Lungo Nespresso capsules, Fortissio is both the highest rated and the most popular capsule. Envivo Lungo capsules are designed for a 110mL brew, making them great if you like a mid-sized cup of coffee to start your day. These capsules use a mix of Mexican and Indian green coffee beans, with hints of caramel and brown sugar and a smooth, rich taste. The sweet aftertaste makes these capsules particularly pleasant. Fortissio Lungo Fortissio Lungo capsules are made using coffee sourced from the West Indies. With a moderate intensity level (Nespresso scores these coffee capsules 6/12 on its intensity chart) and a malty, wheaty taste, these capsules are a great choice if you like a mid-intensity coffee with a taste reminiscent of dark brown bread with ever-so-slight sweet notes. Vivalto Lungo Vivalto Lungo capsules are mild, tasty and extremely pleasant, making them perfect for people who like a mid-sized, non-intense cup of coffee to start the day. These capsules have a slightly woody, smoky taste that fans of café coffee will enjoy. There are also some slight wheat notes to this coffee. Linizio Lungo Linizio Lungo capsules are made using a blend of Brazilian and Colombian Arabica beans. These capsules have a rich but non-intense taste with slight notes of barley and wheat, as well as a great smoothness that makes them perfect for a Lungo-sized morning coffee. If you like intense coffee, you won't like these. However, if you're a fan of coffee that's light, tasty and extremely smooth, you'll appreciate the flavor these capsules produce. Decaffeinato are, as you might expect from their name, Nespresso’s decaf coffee capsules. These capsules offer the same kind of taste as the caffeine-included coffee pods but don’t contain any caffeine, making them perfect if you’re sensitive to caffeine or just don’t want the taste of coffee without the stimulation. There are four different Decaffeinato Nespresso capsules, all of which offer the exact same taste and flavor profile as their caffeinated counterparts. Decaffeinato Arpeggio Decaffeinato Arpeggio capsules offer the same flavor as Arpeggio capsules without any of the caffeine content. Like Arpeggio, these capsules are made using Costa Rican coffee beans with a rich, strong and intense flavor. There are slight hints of dark chocolate to be found in this coffee, as well as a light creaminess that's unique for espresso. Decaffeinato Intenso Decaffeinato Intenso Nespresso capsules are intense, rich and full bodied without any of the caffeine you'd normally expect from an Intenso coffee capsule. These coffee capsules have a dark, rich flavor with hints of dark chocolate and a slight smokiness, making them a great decaf choice if you want a powerful espresso without the caffeine. Decaffeinato Vivalto Lungo Decaffeinato Vivalto Lungo capsules combine the same light, non-intense flavor of Vivalto Lungo Nespresso capsules with zero caffeine, making them perfect if you like a mid-sized, low-intensity cup of coffee to start the day without any caffeine hit. Like the standard Vivalto Lungo capsules, these capsules have a very balanced flavor. They're smooth, with slight hints of smoke and grain, and a very light level of acidity. Brewed into a Lungo coffee (110mL), they offer just the right combination of flavor and smoothness. Decaffeinato Volluto Decaffeinato Volluto capsules taste just like regular Volluto capsules, albeit without any caffeine. These capsules are light, non-intense and refreshingly sweet, even though there is no sugar content. Nespresso make these capsules using high quality South American Arabica beans, creating a smooth taste with mild hints of caramel and fruit. The acidity level is low and the coffee tastes extremely smooth when brewed into a 40mL espresso. Variation Nespresso capsules offer a mix of coffee and a specific flavor. Currently, there are three different Variation Nespresso capsules available: Vanilio (which tastes like a mix of espresso and vanilla), Caramelito (which tastes like a mix of espresso and caramel) and Ciocattino (which tastes like a mix of espresso and chocolate). All of the variation capsules taste great and provide a unique mix on the usual Nespresso taste, making them great if you like a bit of extra flavor to your coffee. Vanilio Vanilio capsules contain vanilla flavored espresso. Designed for a 40mL espresso brew, these capsules have a smooth, low-intensity coffee flavor with a rich vanilla taste. Caramelito Caramelito capsules combine rich, flavorful espresso with a delicious caramel flavor. Designed for a 40mL espresso shot, the cameral flavor in these capsules is rich and sweet, making these great if you feel like a smooth and sweet treat in your daily espresso. Ciocattino Ciocattino capsules are our favorite of the Nespresso variation capsules. These chocolate flavored espresso capsules combine a rich espresso with a smooth dark chocolate taste -- two different flavors that are a perfect complement for each other. How Long Do Nespresso Capsules Last? Nespresso capsules are specifically designed to be long-lasting, meaning you can theoretically keep them for several years before using them. This is because the coffee is stored in an air-tight environment inside the capsule, meaning there’s no risk of mold or bacteria developing. In general, Nespresso recommend using all capsules within 12 months of buying them to ensure freshness. Personally, we’ve found that you’ll get the freshest, richest taste by using your Nespresso capsules within six months of purchase. Some Nespresso machines allow you to make both straight espresso, traditional Americano-style black coffee and also frothed milk drinks like cappuccinos and lattes. If you’re interested in learning more about making lattes and cappuccinos with your Nespresso machine, see our best Nespresso capsules for lattes and cappuccinos guide. You’ll need a Nespresso with a milk frother or a separate steam wand to make a latte or cappuccino at home. If you don’t have either of these, you can also make frothed milk using a French press for mixing with your Nespresso coffee.